This is the ad that was published for S3C41. Translation was taken from Jane Doe (and can be modified if needed). 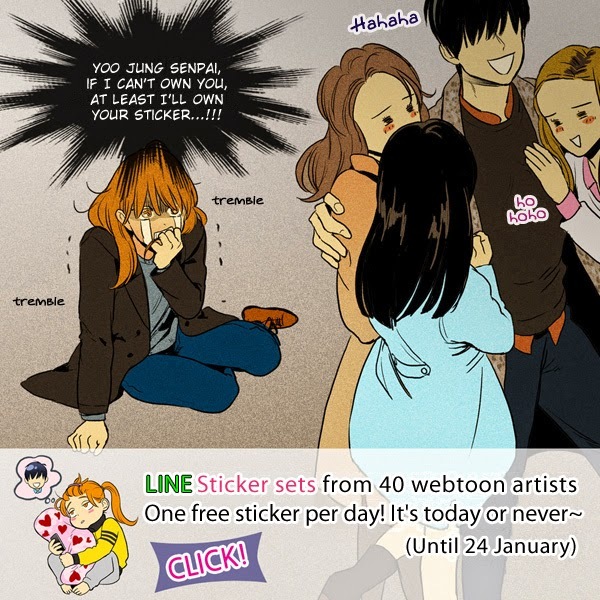 If you visit her blog, there's the Cheese in the Trap sticker, alongside summaries, ads, and many other goodies (the sticker is at the end of the 2014 Illustrations post). (This is Jane Doe. I'm writing this comment again because this is the account with my blog) If you ask me, 'Sunbae' is okay for me. I know Oddsquad's translation supports 'sunbae(Korean)', not 'senpai(Japanese)'. I chose senpai just because Korean word is less known than Japanese. I changed the phrasing of the ads (I'm not an english speaker though =D), but didn't spt the senpai (I'm used to both^^). Doonge// Do as you please. I've never lived in US and I can't distinguish awkward sentences and natural ones. Also, as a fan of manga/manhwa/manhua, I prefer the native terms, so that I can learn the language. So in this case, "sunbae" would be better than "senpai". Still, no big complaints, sooooo happy to have people translating for me. Thank you for all your hard work guys. You bring happiness to us all. Your updates are frequent and that makes me really happy. You guys are the best. You hear me? THE BEST! CiTT is one of my favourite webtoon manhwas and I really appreciate what you're doing here. Keep it up. I love you guys. omg, thanks for translating the ad too! That's so strange. I read sempai as sunbae, then after reading the comments I went back to see that it was sempai... I guess I'm too use to seeing Sul go "sunbae" when referring to Jung.